How can educators ensure that technology-rich learning experiences aren't restricted to the most privileged students? 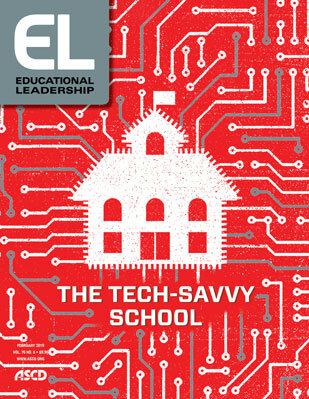 Two major findings stand out from the past 50 years of research on educational technology. First, when teachers get access to new technologies, they typically use them to extend existing practices. Tablet computers replace notebooks, smartboards function like overhead projectors, learning management systems are used to distribute digital worksheets. In recent years, educators have used the SAMR (Substitution, Augmentation, Modification, and Redefinition) model to describe the ideal trajectory of teachers as learners with new technology. The very same general pattern can be found in Judith Sandholtz's research from the Apple Classrooms of Tomorrow project in the 1980s and the five-phase model that she defines as Entry, Adoption, Adaptation, Appropriation, and Invention (Dwyer, Ringstaff, & Sandholtz, 1991). Both models illustrate two things. First, most teachers need to go through a developmental process of professional learning to achieve more ambitious transformations of teaching through technology. Yet most teachers do not do so. I state this as an empirical observation and not necessarily as a criticism. Second, the teachers who do develop innovative uses of technology are more commonly in learning environments that serve affluent and advantaged students. Most educators are familiar with the "digital divide" as the gap in access to new technologies found between more and less affluent students, families, or school communities. In the early 2000s, sociologist Paul Attewell (2001) proposed a second digital divide: the usage divide. In his research, Attewell used anthropological observations in schools and classrooms to document the different levels of parent support at home and content rigor in schools. Even when access gaps are closed, white and affluent students are more likely to use technology for creativity and problem solving with greater levels of mentorship from adults, while students from minority groups and low-income neighborhoods use technology more commonly for routine drills with lower levels of adult support. The base of empirical research for this second claim is now robustly established, as my colleague Mimi Ito and I (2017) argue in a recent report, "From Good Intentions to Real Outcomes: Equity by Design in Learning Technologies." With the widespread adoption of large-scale digital learning environments over the last 20 years, we have even more granular data to investigate this phenomenon. In research that I conducted on classroom uses of wikis (Reich, Murnane, & Willett, 2012), I found that schools serving more affluent communities were more likely to have students create wikis and use them for student-led activities, whereas in schools serving low-income neighborhoods, wikis were more likely to be used as teacher-centered, content delivery tools. Similarly, when MOOCs burst onto the scene six years ago, there was great hope that they could democratize access to higher education. However, we've shown strong correlations both globally and within the United States between markers of affluence and both the likelihood of enrolling in and completing a MOOC (Hansen & Reich, 2015; Kizilcec et al., 2017). Extending Attewell's anthropological work into the 21st century, researchers like Matt Rafalow (2018) have documented that depending on the population, adults in schools can treat kids very differently for the same behaviors. He observed that in an affluent, mostly white school, when kids played around with computers, computer games, and maker activities, they were celebrated as hackers, with adults acknowledging connections between digital play and future opportunities in a digital workforce and civic sphere. In a school serving mainly Latino students, however, kids who engaged in similar activities were viewed more negatively by adults: They were regarded as slackers, and their behavior was treated as deviant. Attewell's cautions from 2001 ring true today: "[There is a] real possibility that computing for already-disadvantaged children may be dominated by games at home and unsupervised drill-and-practice or games at school, while affluent children enjoy educationally richer fare with more adult involvement." Thus, school districts that serve diverse student bodies—or homogenous student bodies in poverty-impacted communities—face a special dilemma in technology adoption and integration. Technology adoption can accelerate inequalities within individual schools. During my doctoral research, I surveyed teachers and observed classrooms across the country with respect to their adoption of what were then called "Web 2.0" tools for creating content collaboratively online. I routinely heard teachers say that when they designed new units that emphasized digital learning, they deployed them more commonly in their advanced track classes, where classroom management and content pacing were less daunting challenges. Since tracking closely correlates with race and income, this suggested that in practice, teachers devoted their ed-tech planning energy toward their already (comparably) affluent and advantaged students. That said, however, we must also remember that differences in technology adoption can accelerate inequalities between schools. The recent documentary "Without a Net" features two schools in the Philadelphia-area that are only five miles apart: one suburban high school has a fully stocked robotics lab where students program Raspberry Pi computers to steer robots through challenges. The neighboring high school closer to the city has virtually no technology and an unusably slow internet connection (watch the film at digitaldivide.com).1 As technology transforms civic life, the trades, professions, industries, and academic disciplines, it becomes increasingly difficult to prepare students for a networked future without equitably engaging them in networked learning in schools. What strategies can school leaders and teachers use to address these barriers to equitable digital learning? I wrote the first half of this article with great confidence: The research on the challenges of educational technology and equity is well-established. The second half is much more speculative: Educational researchers can speak with less confidence on how to address the problem. There is an urgent need for researchers, technology funders, developers, and classroom educators to come together and discover how best to ensure that emerging technologies serve the students furthest from opportunity. In the meantime, here's the best advice I have, based on my own observations and experiences. Teachers' use of technology is generally reflective of other pedagogical proclivities. The recent report "The Opportunity Myth" argues that many students simply aren't given access to rigorous, on-grade-level materials (TNTP, 2018), findings that echo those in Jeannie Oakes's (2005) landmark book Keeping Track. If students aren't encouraged to engage with a challenging curriculum, it doesn't matter whether they learn from that curriculum on paper or on a computer. If teachers approach their students with a deficit mindset, the students' sense of self-efficacy withers either way. I do not mean to argue that the problem of low expectations needs to be fixed before attending to issues of digital equity; in fact, sometimes large-scale technology adoptions can be powerful moments for educators to reflect on the larger questions around what students are capable of. But I do believe that in many schools, digital equity is inextricably linked to pedagogical and structural inequity more broadly. The first step toward digital equity is helping educators learn everything they can about equitable teaching practices in general. Even if technology usage patterns are closely tied to larger patterns of bias in education, however, there are some distinct steps that school leaders can take to break the patterns of ed tech being primarily used for isolated, low-rigor activities. Reframe adult thinking: In my field research, I found a striking pattern in how teachers discussed technology and equity. Nearly every teacher that I talked to was concerned with educational equity, but some were more focused on inequalities within schools ("Some of my students don't have access to technology"), whereas others were more focused on inequalities between schools ("My students in the city don't have the same opportunities as kids in the suburbs"). What I discovered, interestingly, is that the former concern typically led to more limited tech usage in classrooms: Teachers who focused on within-school inequalities tended to limit practices that couldn't be conducted equitably. For instance, they often avoided assigning projects that involved technology usage outside of class—learning experiences that are common in more affluent schools. By contrast, when I met with the few teachers who did happen to be doing innovative work with ed tech in low-resource settings, those teachers tended to be more concerned with between-school inequalities. That perspective on inequality fueled their commitment to opening classrooms early and late and making resources available in libraries and after school, so that their students could use technology in novel ways even if access outside of the classroom was a challenge. I don't mean to suggest that my informal research findings are definitive proof of a trend, but I think school leaders can productively engage their faculty in conversations about how we as educators think about inequality, and how our framings impact our choices. One useful entry point might be two books by media scholar S. Craig Watkins—The Digital Edge (NYU Press, 2018) and Don't Knock the Hustle (Beacon Press, in press). Both books approach the creative online endeavors of low-income black and Latino youth through an asset framing, showing teachers a broader view of what's possible for all students. Connect to students' outside interests: Matt Rafalow's research on how educators view the technology use of affluent students more favorably than that of less affluent students opens the door to conversations about bias. Kids' interests—in music, games, making, hacking, and so on—should be seen as gateways to engagement and opportunity. One approach to reframe these conversations is to explore the body of ideas called Connected Learning developed by Mimi Ito and colleagues (2013). Connected Learning advocates argue that schools undervalue the learning activities that students do outside of school, particularly when those activities don't naturally connect to traditional academic subjects. Kids who barely scratch out a few sentences to a standardized test prep question might be writing thousands of words of Warrior Cats fan fiction at home at night. How can teachers, parents, and informal educators help the young girl writing rap lyrics and remixing tracks in the afternoon see connections to careers in communications, sound engineering, or related fields? The rapidly growing eSports leagues, where schools sponsor teams to compete in online games like Overwatch and League of Legends, can provide opportunities for students to connect their interests in gaming to career opportunities in programming, marketing, communications, and other fields. Networked technologies can play a powerful role in connecting kids' interests outside of school with learning opportunities in schools, after-school programs, and other third spaces. Engage families: Some of the most exciting research in digital equity involves engaging families. TechGoesHome in Boston is a program that provides low-income families with low-cost laptops, along with learning opportunities about how to use computers for work, leisure, and learning. Kids not only get a computer in the house, they get a more tech-savvy parent who is better equipped to support them with homework and other school projects. Similarly, Family Creative Learning is a project out of the University of Colorado that seeks to build young people's capacity around creative computing and making by engaging the whole family in multi-generational learning (Roque, 2016). If it takes a village to raise a child, then teaching whole villages is a promising strategy for digital equity. Require opportunities for all: Schools should pay particular attention to where students get rich digital learning opportunities in their courses, and who can and does take advantage of these opportunities. In some schools, digital learning primarily takes place in computer programming or other technology classes. When these classes are electives or optional after-school activities, white and Asian boys are disproportionately more likely to opt-in, which shuts out girls and underrepresented minorities. Students have more equitable access to these learning experiences when they are required in the curriculum, either through new classes or through the integration of programming in math and science classes, with the help of programs like Bootstrap (teaching Algebra through computer game design) or Project GUTS (incorporating computer simulation in middle school science). As school leaders make plans for where digital learning happens in the curriculum, they must consider adopting pathways that engage all students and look carefully at how optional programs can functionally exclude students who are already underrepresented in technology. Conduct an audit: Finally, educators cannot address problems that they don't understand in their local context. Conduct an audit of rich digital learning opportunities in your school: If they accrue primarily to more affluent students in advanced tracks or to boys in particular courses, consider how curriculum mapping and course planning could make those opportunities more equitably distributed. Survey parents to figure out how comfortable they feel providing support for digital learning and develop rich learning experiences to help them provide better coaching and monitoring at home. Ask teachers how much considerations of equity enter into their planning around educational technology. If the topic elicits thoughtful answers, figure out how teachers with the most considered ideas can share their practices; if the topic elicits short responses, use the salience of digital equality to start a broader conversation about equity among your faculty. There are no silver bullets in education. There is no problem that educational technology will magically solve. The hard parts of creating equitable schools will remain hard. But the great potential of educational technology to improve teaching and learning will only be realized if our ed-tech efforts go hand in hand with a commitment to digital equity. › How do you factor in equity, beyond access, as you plan for technology integration in your school or classroom? › Can you think of a time that you used technology to simply extend existing practices in your classroom? How could you have approached that lesson or activity more meaningfully? › Have you and your colleagues considered conducting an audit of digitally rich learning opportunities in your school or district? What do you think such an analysis would find in terms of possible digital divides among students? Attewell, P. (2001). The first and second digital divides. Sociology of Education, 74(3), 252–259. Dwyer, D. C., Ringstaff, C., & Sandholtz, J. H. (1991). Changes in teachers' beliefs and practices in technology-rich classrooms. Educational Leadership, 48(8), 45–52. Hansen, J. D., & Reich, J. (2015). Democratizing education? Examining access and usage patterns in massive open online courses. Science, 350(6265), 1245–1248. Ito, M., Gutiérrez, K., Livingstone, S., Penuel, B., Rhodes, J., Salen, K., et al. (2013). Connected learning: An agenda for research and design. Irvine, CA: Digital Media and Learning Research Hub. Kizilcec, R. F., Saltarelli, A. J., Reich, J., & Cohen, G. L. (2017). Closing global achievement gaps in MOOCs. Science, 355(6322), 251–252. Oakes, J. (2005). Keeping track. New Haven, CT: Yale University Press. Rafalow, M. H. (2018). Disciplining play: Digital youth culture as capital at school. American Journal of Sociology, 123(5), 1416–1452. Reich, J., & Ito, M. (2017). From good intentions to real outcomes: Equity by design in learning technologies. Irvine, CA: Digital Media and Learning Research Hub. Reich, J., Murnane, R., & Willett, J. (2012). The state of wiki usage in U.S. K–12 schools: Leveraging web 2.0 data warehouses to assess quality and equity in online learning environments. Educational Researcher, 41(1), 7–15. Roque, R. (2016). Family creative learning. In K. Peppler, E. Halverson, & Y. Kafai (Eds. ), Makeology: Makerspaces as learning environments. New York: Routledge. Justin Reich is assistant professor of comparative media studies and director of the Teaching Systems Lab at MIT. He is a cofounder of EdTechTeacher and a fellow at the Berkman Center for Internet and Society at Harvard University. Follow him on Twitter.